Excoriating words carried in high fidelity the hundred yards from our neighbors’ house among the Palouse Hills¹ were often the first sign Mr. Bauer was preparing his family for a weekend trip to the lake or mountains. My school friend Brett and I would remark on the irony of his dad’s stressful preparations for, ostensibly, relaxation. My first overnight ride of the year was a last minute affair that came together, it would now seem, in memory of Mr. Ronald Bauer (June 7, 1945 – July 12, 2007). Twilight approached by the time I was able to arrange new gear and depart for untested trails. Already impatient, my ire was further elevated when the imagined shortcut to Blacks Creek Road from the end of Federal Way past Micron² was precluded by an impassable fence not visible, unsurprisingly, in Google’s aerial views. I beat a quick retreat over to Technology Way and the Oregon Trail where the rough Jeep trail taught me the inadequacies of my Kriega luggage setup,³ the bags bucking and agitating against me. No doubt those who travelled this way in wagon trains from Independence, Missouri 150 years ago would sympathize. 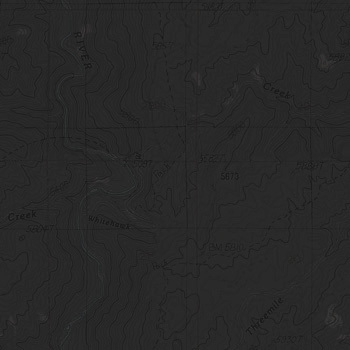 I didn’t noticed the “Trail Difficulty” symbols on the Forest Service Danskin map² but learned later my route was almost entirely in the “most difficult” category. Luckily, “most difficult” doesn’t mean impossible, it just means problematic luggage will bounce even more and eventually break the anchor point, requiring some cursing, trailside MacGyver work and slower riding. A few weeks ago I joined the Treasure Valley Trail Machine Association and had some intention of participating in their “Blacks Creek Fun Day,”³ a club euphemism for a day of hard work clearing trails. Instead, Jessica and I enjoyed a rare and relaxing night away. I didn’t expect the group to still be around when finally I made it to the hills late in the day but there they were, their camp trailers circled almost like pioneer wagons against native attack along Blacks Creek Road. I considered for a moment descending to join them but it wasn’t the kind of camping I was aimed for. Next time. It wouldn’t be a solo ride if there wasn’t some element of optimism induced misadventure. Crossing the ridge from Flat Creek to Willow Creek on trails 310 and 401 had required enough time and effort that I doubted I could get over the next ridge to Fiddler Flat with any light remaining. I decided to camp along Willow Creek. It was one of my rare, wise decisions. I still had to put the tent up in the dark but I’m sure it beat riding unfamiliar single track in the dark. The return ride along Willow Creek was glorious. Winter and Spring have been fairly dry so the many creek crossings were an easy affair.